Last fall, Google released the first pint-sized streaming device: the $35 Chromecast. The $50 Roku Streaming Stick soon followed. They look like flash drives, both plug directly into an HDMI port, and both are reasonably priced. You can access a huge selection of online streaming services with either device, which you can control via a smartphone or tablet. To help you decide, we compared the two streamers in five categories: supported apps, basic remote control, advanced remote control, power consumption, and startup time. You can decide which of these categories carry the most weight. If you’re a fan of PBS, you want a stick that supports public television’s streaming service (and not just PBS Kids). The same goes for iFood.tv or Warner Archive Instant. Or, for that matter, some service you’ve never heard of but may one day discover and love. You don't install apps on the Chromecast itself, and it has no native interface. Instead, you seek out mobile apps that support Chromecast, find content in those apps, and then press the Cast button, seen here next to the search icon. Both sticks support hundreds of streaming services for movies, TV shows, sports, news, education, and your own photo collections. Roku has 1,800 channels in its Channel Store, and while the Chromecast apps site doesn’t give exact numbers, it lists hundreds of compatible apps. But they’re not actually Chromecast apps, in that you don’t install them on your Chromecast itself. They’re Android and iOS apps that support Chromecast. If you’re watching a show in your phone’s Fandor app, for instance, you can tap the Chromecast icon and send the stream to your television. It’s worth noting that you’ll find considerably more Chromecast-compatible Android apps than iOS apps. Both sticks support popular services such as Netflux, Hulu Plus, ESPN, YouTube, and Pandora. But Chromecast is weak in the pay-per-view area. It lacks Amazon, Blockbuster, and M-GO, and the Android Vudu app isn’t well designed for a phone’s small screen. Chromecast just recently gain seven new apps, though, including Comedy Central, Nickelodeon, and Sesame Street Go. So this matchup is still evolving. Both devices provide various ways to view your own photo and video collections, and listen to your own music, too. Who wins? Roku wins this round, largely for the greater pay-per-view selection and the general numerical advantage. Plus, the Channel Store makes it easy to find and add new channels to your Roku stick directly from its own interface. With a Chromecast you must take the extra step of seeking out compatible mobile apps. Any device that streams video to a television needs the basic functions of a remote control: pause, play, fast forward, and so on. But of the two sticks, only the Roku comes with a physical remote control. Granted, it’s not a great remote. It’s small and feels flimsy. But it’s a real remote. You don't need to find your smartphone, unlock it, and launch an app. Once you know the remote’s layout, you can hit Pause by touch. To me, this is a huge advantage. Roku's remote isn't amazing, but I'm happy to have it. Not everyone agrees. Some people hate physical remotes, pointing out that they can get lost, and require extra batteries. Those people can use the virtual remote included in Roku’s apps for iOS and Android. Each app not only simulates the physical remote, but also offers other tools, allowing you to easily select channels, and play your phone’s locally stored music, photos, and videos on your TV, although the file formats are limited. If your smartphone or tablet locks while you're watching your Chromecast, basic controls on the lock screen let you pause without having to enter your passcode. The Chromecast doesn’t have a physical remote. There’s an app (iOS and Android) for setting up the device, but you control playback directly with whatever mobile app you’re using. If you’re watching Hulu Plus, for example, you pause and rewind with the Hulu Plus app. If your device goes into lockdown mode while you’re watching your Chromecast, you can just press the power button, and basic controls will appear on the lock screen, a nice touch. Who wins? The Roku wins this one. For the simple tasks, a physical remote is easier to grab and easier to use. You don’t even have to look at it. Roku’s physical remote is much less useful when it comes to Internet streaming. If you’ve ever tried to enter search text—or worse, your email address and password—by using the arrow keys on your remote to select one letter at a time, you know exactly what I’m talking about. The Roku app lets you use your phone or tablet's keyboard to type in search queries. The Roku app makes a significant improvement. An icon on the virtual remote screen brings up your device’s keyboard, allowing you to simply type. If you have a password manager on your device, you’ll be able to paste in passwords without even typing them. But I couldn’t get the typing feature to work with every Roku channel, such as YouTube and Vimeo. Logging into services and searching for content is easy with the Chromecast, because you’re using each service’s mobile app to do it. Scrolling pages, tapping icons, and typing text come naturally in these apps. With very few badly designed exceptions (Vudu on a phone comes to mind), this really is tap and watch. Who wins? Chromecast wins this category hands down. Both of these sticks sip small amounts of energy when in use. When streaming a 1080p HD broadcast, the Roku uses about 2.4 watts. The Chromecast did only a little worse, with 2.5 watts. I call that a tie. What about when they’re not in use? After all, neither of these devices have an Off button. As long as they have access to electricity, they’ll use it. And they’ll use almost as much when not streaming as when streaming. When not streaming, the Roku burns 2 watts, and the Chromecast 1.9 watts. (Again, basically a tie.) Either one of these will burn more than a kilowatt-hour in a month of no use. To kill power to either stick, you have to unplug it—unless you have it plugged into a USB port on your TV, in which case it only gets power when your TV is on. You must unplug the stick from power to avod this problem. Each has a micro-USB port that you connect via cable to a USB power adapter or a powered USB port on your HDTV. 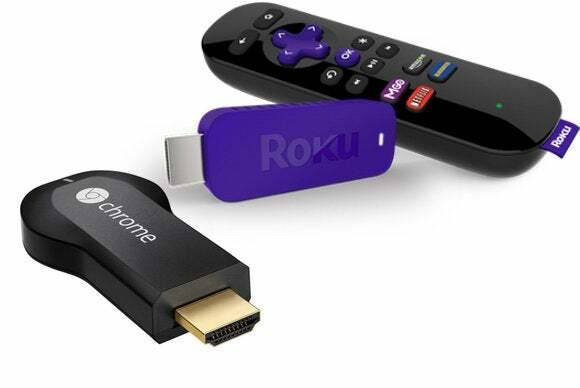 Note that if you do plug your Chromecast or Roku Streaming Stick into a USB port on your TV, it will only get power when your television is on. Who wins? Nobody. It’s a tie. If you power your stick through the TV’s USB port, it will have to go through its startup routine each time you use it. And that means you’ll have to wait a bit—but not too long. In my tests, the Chromecast started up in about 24 seconds. The Roku took almost a minute and a half. The Roku tries to entertain you with an animated logo while you’re watiting, but that gets old quickly. Who wins? No contest here—the Chromecast wins. Roku won two categories, Chromecast two more, and the fifth is a tie, so it really comes down to personal preference. I own both of these, but I seldom use the Chromecast outside of testing. The physical remote plays an important part in my choice, as does the wider selection of apps. If your tastes are more esoteric, if you want pay-per-view choices, or if you prefer a physical remote control, Roku makes the superior device. Otherwise, save $15 and go with the Chromecast.